It seems like the wish list is never ending when it comes to kit. Even with this new kit I still have 3 more very desirable items I wish to acquire over the next 12 months. But I'll have to see how the budget goes first. Anyway, in order to have a test run I requested the assistance of a couple of lovely young ladies. The first being Vickie Deakin who is a newly qualified makeup artist. As she is a friend of my step daughter I'd seen her work on Facebook and thought she was worth a try. I'd used makeup artists in the past but hadn't found one I was happy with, until now that is. I, myself don't know much about makeup but seeing Vickie work I am confident that she does. And I look forward to working with her again in future. And the second is our lovely model Faye Strachen. I stumbled across her photo on Facebook as she too is a friend of my step daughter. I liked her look and I wanted to work with someone more typical of the sort of person who might use my services, rather than an experienced model. And she worked perfectly for this task at hand. The 2 images above were created using natural light that I modified using the Lastolite Skylite that fits perfectly in my trifold door. I love the light this gives and it was perfect for this look. However its not always possible to get this quality of light (depending on the time of day I am shooting and just how bright the light is at the time) so I can't rely on it. I'm currently working on using my large softbox in conjunction with the Lastolite Skylite to achieve this look whenever I want it. I shall post more on this subject when I feel I've got it just right. For now though, here is a pull back shot of how I used the Lastolite Skylite with the trifold door. Makeup-wise, we started with more of a day look for these bright boudoir type images then worked our way up to dark smoky eyes for more of the beauty shots. And it was for these beauty shots that I started using the new lights. This technique has been taught by Faye and Trevor Yerbury and it was something I wanted to try, although I added a third light from below to add a little something else to the shot. 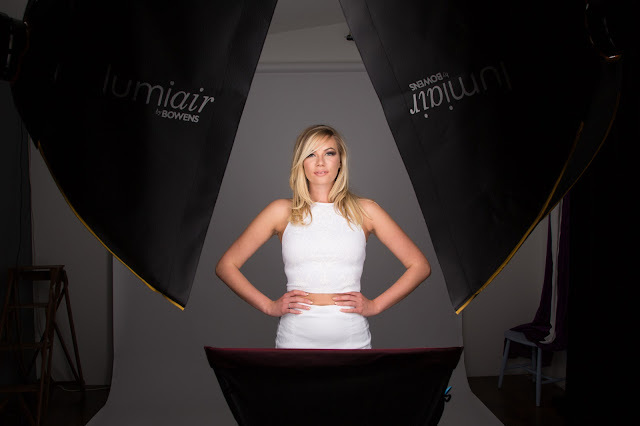 For this I used my new Bowens strip boxes (100x40cm) along with my old Bowens 60cm square softbox on a floor stand. It created beautiful soft light along with some interesting catchlights. The same technique was used for the image below. Its a bit of a ringflash sort of look, something else I've been wanting to invest in but that is quite a lot out of budget so the ringflash could be years away for me. But it sure would be fun. Here is a pull back image of this lighting set up. I will definitely be using this again. The next 2 images were created with the beauty dish. This is a lovely light too. I don't have a pull back of this set up. I often forget to do pull back shots but I'm trying to make a point of doing so more often. The beauty dish is a gorgeous light that works so well with beauty type setups, hence its name. I that brings us to the Fresnel spot light. This is such a great light and I just did not do it justice. It was definitely one of those cases where I tried to do too much in one session. We all pretty much had had enough by this point. But I just had to try it. I've wanted this light modifier for years and I finally have it now. So I'd better start making good use of it. But this is what I got for now. I'm really looking forward to getting to grips with this new tool. I am going to love working with my new equipment and really getting to know it all like I know my large softbox. Thats the problem really. I am so comfortable with my usual lighting that its hard to move away from it. But I'll get there and I'm going to have great fun doing so. Zoe returns, this time with baby!!! This was a great opportunity for me to experiment in my new studio. Zoe let me do this with her baby bump a couple of months ago with great success so we took the time again, this time with her new baby. Some experiments were successful and some where not. But that comes with the territory. You can't find new and exciting ways to shoot without finding a few bad ways too. I'm just greatful that the only mess we needed to clean up in the end was a little wee. It could have been a whole lot worse. As usual, Zoe photographs so well and I am again so pleased with the results. She is going to have some great images to show her daughter when she grows up. Zoe looks absolutely fantastic, and without any signs of having been pregnant just a few short weeks ago. Of course, apart from her bump she hardly showed any signs of even being pregnant. If only all women could be this lucky. London in Spring, Whats Not to Love? Well I know there is still a lot not to love but I'm choosing to see the great things about London at the moment. I am having a ball this year visiting London as often as I can. Which is unusual for me since I usually prefer the comfort of my own home, in rural old Leicestershire. Staying home and avoiding people has always been the easy option. But this year, possibly due to the wonderful weather we keep having, has me longing for venturing out. You may remember a while back when I did a casting call looking for teenage boys and girls. Well this is the girl I chose. I had quite a specific look in mind, one which included really long hair. I have always had a thing for long hair. The choice also became quite simple when this young lady put herself forward as she is someone I've been photographing through school for several years and she is a past member of the Hinckley Athletics Club where she has been coached by my husband for nearly as many years. He's always had a soft spot for her, being one of his first members which helped my decision. When I have projects where I want to work with a model rather than a paying client I like to use friends or past clients whenever possible as it enables me to give something to those who have been loyal to me. 4 Merits, 3 Finalists, 2 Awards and a Masters! This past week at the Societies of Photographers Convention in London was just about perfect in every way. As always I look forward to this event with mixed emotions. As a judge and speaker anxiety levels can be high. And I always know that through both working and socialising it can be an exhausting experience that is often hard to get through. However the high I finish on is simply incredible and worth all the sleepless nights and hard work, in large part due to the incredible people with whom I get to spend this week. I'm Isabelle Stratford from Redmoor Academy and I've been doing my work experience here at Christina Lauder Photography with my friend Sophie. I'm very interested in photography and currently taking it at GCSE and working here throughout the week has helped me learn several different things about the profession.